Zebra Crab on a fire urchin. These little crabs are about half an inch across the top of their shell. My apologies for my long absence from the blog. I don’t know where life goes – but it seems to be whizzing by. Lots of travel and other events are keeping me hopping. Since I last blogged, I’ve been diving in Indonesia (Bali and Alor), and in the Philippines (Puerto Galera and Anilao). I do have lots of photos and info to share from these adventures. When life slows down a bit, I will commit to making more regular posts here. In the meantime, if you are on Facebook, you can follow me if you’d like, and see my more frequent postings, including photo shares, here – Judy G Diver. Select the “follow” button, and my stuff will show up in your feed. You can also follow me on Instagram if you search with the same name (Judy G Diver). 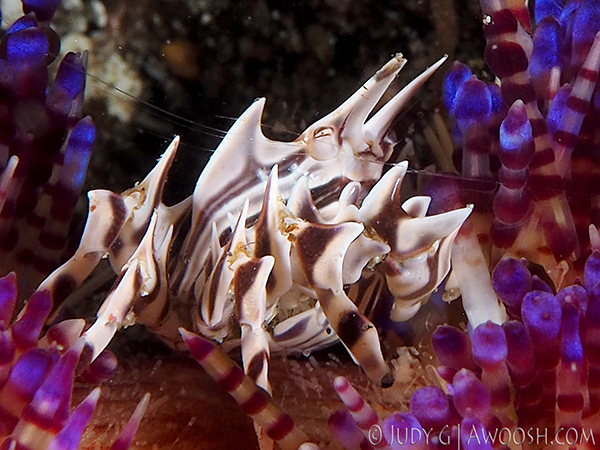 This entry was posted in All About Scuba Diving, Image Galleries, Scubadiving Magazine Photo Essays and tagged Judy G Diver, Muck Diving, zebra crab. Bookmark the permalink.